We bring you a hot exclusive: brand-new exclusive photo’s taken from last week’s gig at Prague, Czech Republic. These are GREAT shots, even though ameteurs. Great size for background wallpaper… Kudos to frequent contributor, Bernd Dittrich! Three new magazine articles have surfaced from the Czech Republic. 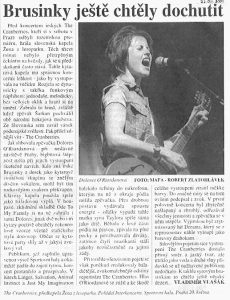 The first one is from the Czech edition of Rolling Stone, whereas the other two are Prague concert reviews (with photos!). I can’t read them, but it’s nice to see that the second article gave the show a 4/5 stars. Thanks again to our frequent contributor, Bernd Dittrich, we have an exclusive review of last Saturday’s gig. the concert in Prag was not on Monday, but on Saturday. In opposite to the other concerts, they played in Europe on this tour, they played “Go your own way” and “I just shot John Lennon”. 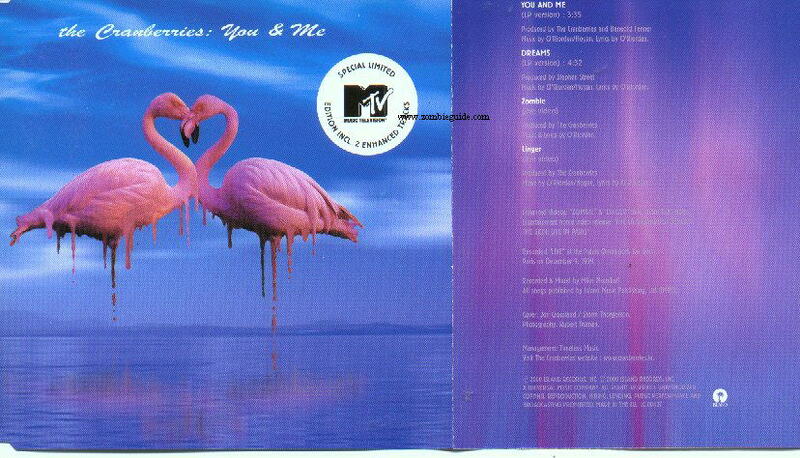 They didn´t play “You and me” and “Dying in the sun” this time. As soon as I received the photos, I will send you some scans. 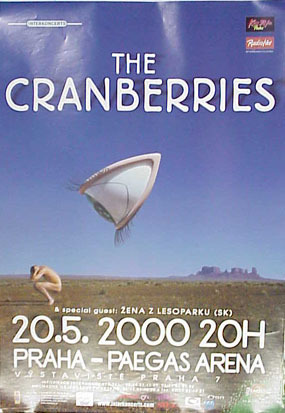 For those that missed it, the Cranberries played a gig at Prague, Czech Republic, on Monday [correction: Saturday]. Hopefully, we’ll have pics and reviews soon, but for now, here’s a concert poster from the show. Yay. Same old, same old. However, “Desperate Andy” is one you won’t find everywhere, so that’s good 🙂 The show airs this Friday, May 12th. It’s a public TV show, so be sure to check your local listings for exact time and channel. 1. 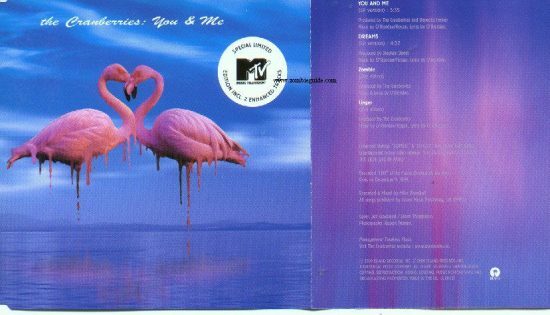 Shania Twain – Man! I Feel Like a Woman! As you may recall, the live tracks were recorded last December 9th in Paris for the upcoming “Beneath the Skin” VHS and DVD. In case you’re not pound-friendly, £2 million is approximately $3.1 million US.